blanket for a friend's first baby, knit in lace-weight cashmere yarn doubled or tripled to roughly 4ply weight, crochet border. it was this friend who first introduced me to the jackalope, so i see it as her mascot. after several abortive experiments, including one i hope never to repeat in fairisle on the flat, i decided on duplicate stitch as the most sanity-preserving option. 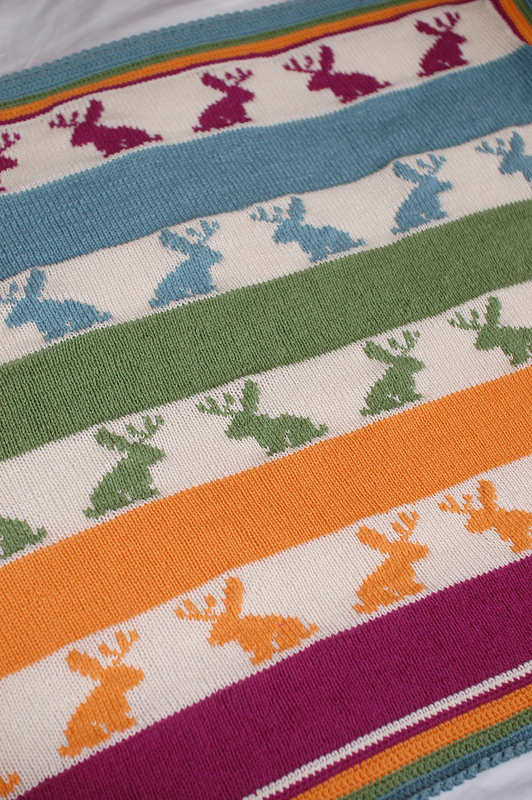 each jackalope took 45 minutes, never mind the 36,000 stitches in the stripes, truly a labour of love. the yarn was left over from a simple striped blanket i made for my youngest. for anyone wondering about the practicality of cashmere for a baby, these yarns (from colourmart) machine wash beautifully on a standard setting. each wash fluffens the yarn until it's cloud soft.